As you know, I’m a huge fan of all-natural, fresh ingredients…especially ingredients that you can pronounce. 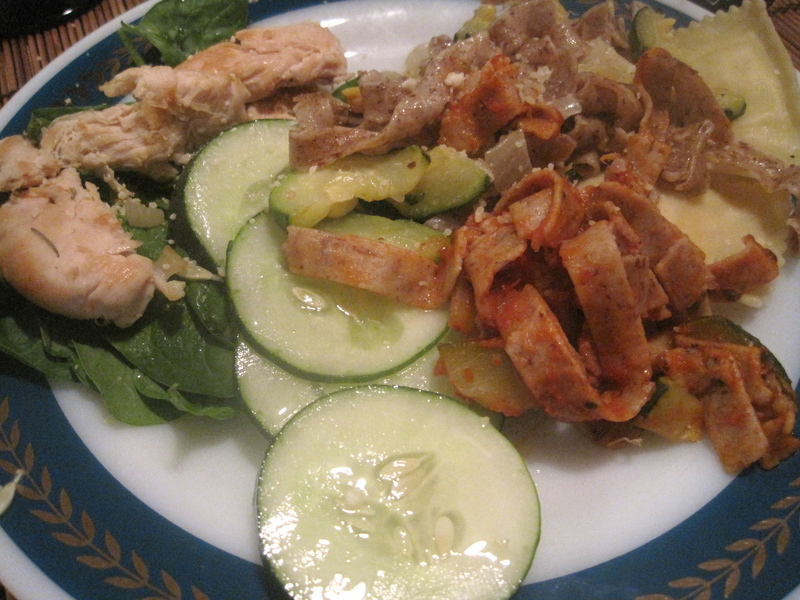 Yes, it’s true that I used to be a calorie-counter and low in calories meant it was good for me. But that all changed when I went to Italy four summer’s ago. I remember before I embarked on my journey I was SO nervous I was going to gain tons of weight while abroad: loads of pasta, pizza and bread, what am I going to do? Needless to say, I had a minor panic attack. However, when I got back from my two month trip and stepped on the scale, the exact opposite was true: I had lost five pounds. Yup, that’s right. I lost five pounds with my only exercise being walking to school and the local markets every day, and while eating lots of fresh pasta, breads, cheeses, fruits, veggies and even a serving of gelato daily. It’s no miracle as to why I lost the weight. You see, what they serve in Italy is completely different than the “Italian” food you see here. It’s unbelievably fresh (god take me back there now), local (I bought everything I ate from markets on the street), and most importantly utterly delicious. They don’t add all the crap we add to our food, and most importantly you know what you’re eating when you order it. If I order a pasta I’m going to get a handmade fresh pasta with minimal sauces added on. There food isn’t drenched in Alfredo sauce or drowned in butter; it’s meant to be eaten as is. And boy do I miss that way of life. Well, yesterday when I went to visit the lovely ladies at Nella Pasta, they took me back to my Italian ways for a while. 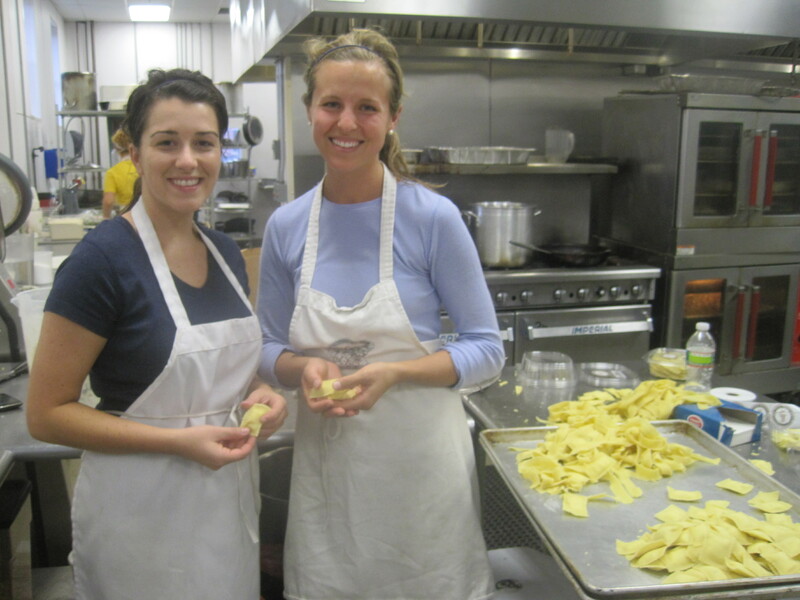 Two friends and life-long foodies Rachel and Leigh are the masterminds behind the speciality pasta company, crafting up handmade, fresh and healthy pasta. Yes, you heard that right: it’s healthy and delicious! Why Nella? Well, that’s the best part about it! They chose the name Nella, translating to “in the” in Italian, to express their dedication to using only simple, local ingredients in their pasta. This year they’ve teamed up with a variety of local MA farms where they get all their yummy, wholesome ingredients from! Um…what could be more local than that? Anywho, I decided to give the pasta a shot myself to see what all the hootin’ and hollerin’ was about and boy was I in for a treat! While my roommate was at the gym, I crafted up an entire Italian feast. 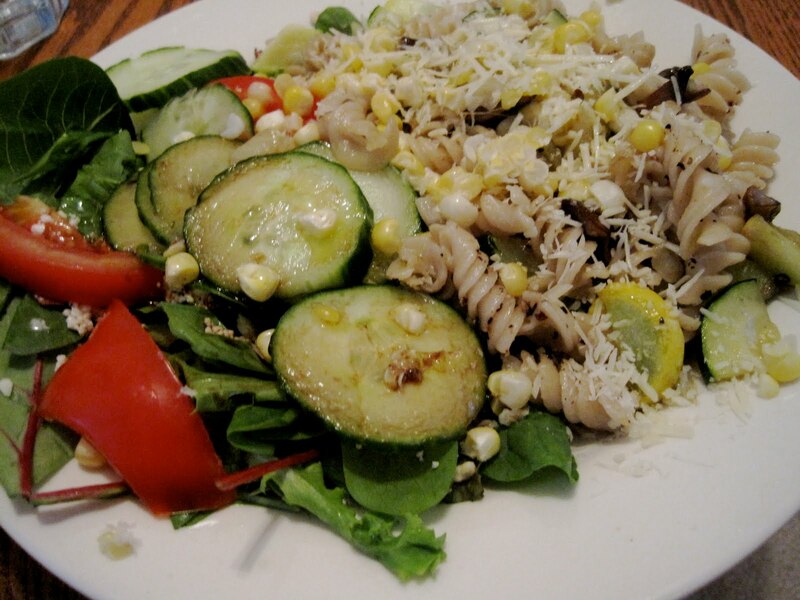 As I sipped on a glass of “Well Red” wine from Trader Joe’s (sulfite free), I sautéed some zucchini, yellow squash and sweet onion in olive oil, salt and pepper to go with one of the pastas. 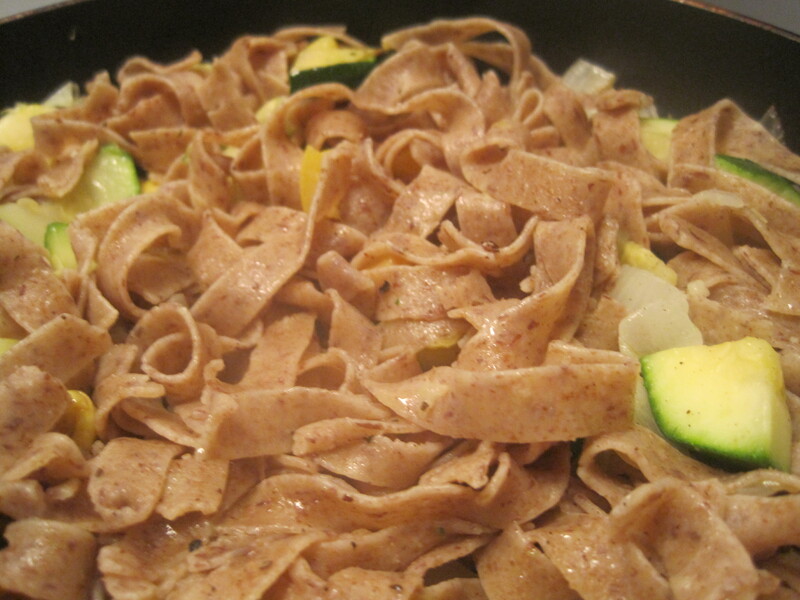 I then boiled up their Wheat and Ground Flaxseed Fettuccine (only takes a minute to cook in boiling water). Once it was finished, I used half of it in my fall veggie mixture and added a little parmesan cheese, and the other half I mixed with organic marinara sauce because I know my roomie loves the red sauces. Oh, but wait that’s not it! 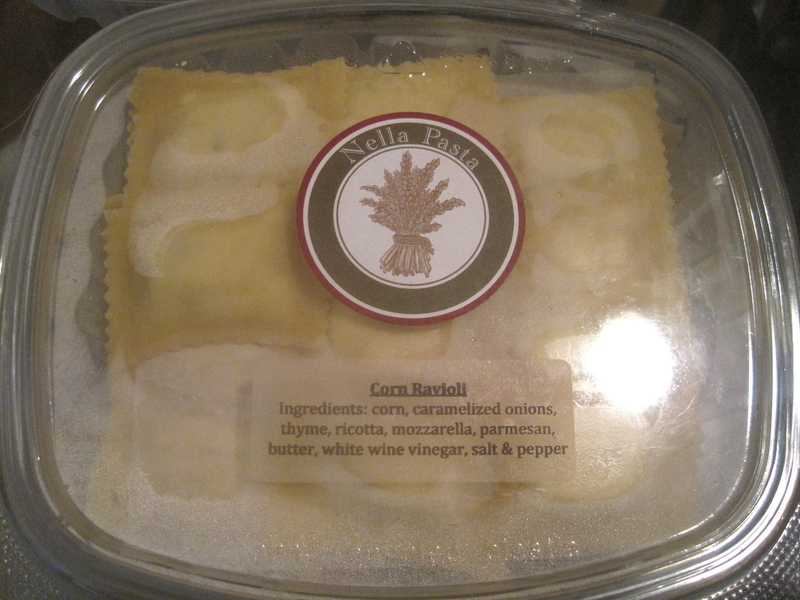 I just had to try some of their ravioli so I gave the Corn Ravioli a shot, which is made with fresh corn, caramelized onions and thyme. How could I not want to eat that right out of the container? 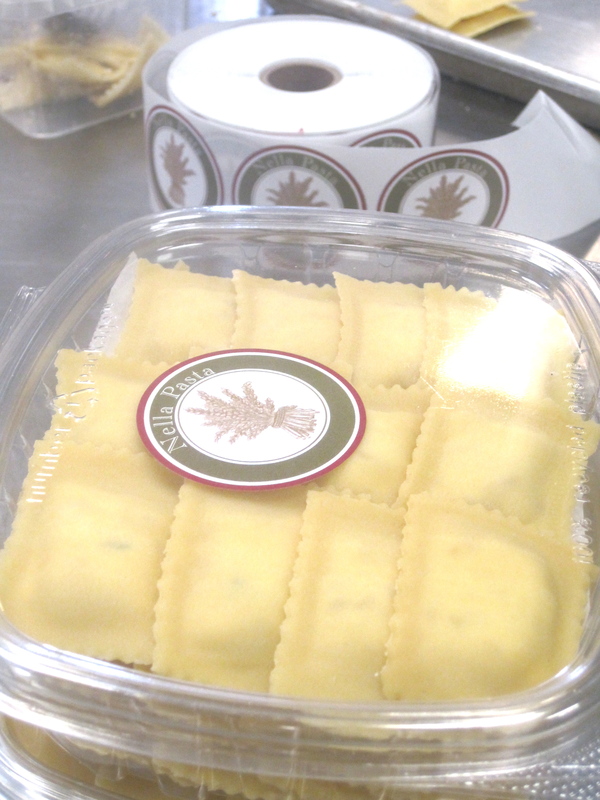 But no, I had to cook it first, for just a minute or two until the ravioli floated to the top. Needless to say, everything was delicious and I was a very happy girl! My roommates and I both licked our plates clean, but left some in the fridge for leftovers which we are both so excited about. 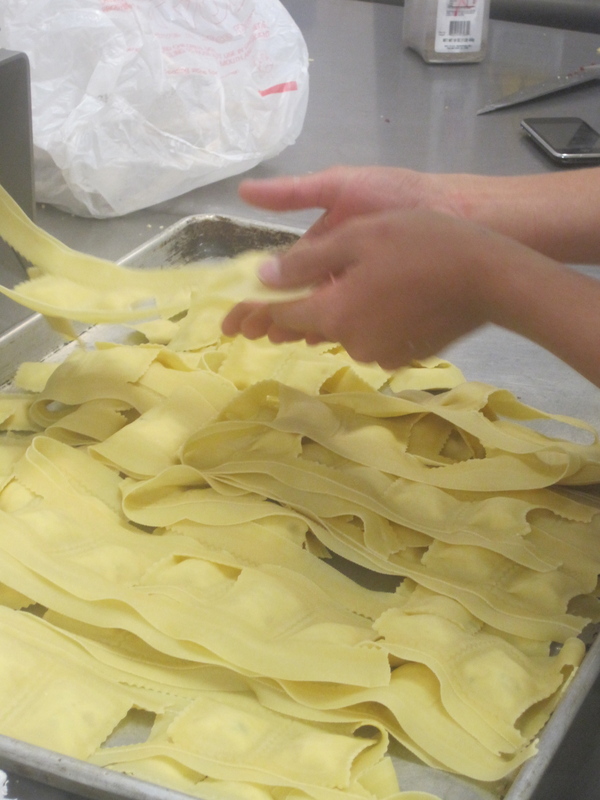 Our fave was the ravioli, but the flax pasta was right up there. The fresh, healthy taste was apparent and I felt good about eating it, not gross or like a big blob as some pastas can do. I’d call this as close as a wholesome meal as you can get. As if these girls behind Nella Pasta aren’t superstars as is, they’ve also been selected by DailyCandy as a finalist in the Start Small, Go Big Contest for aspiring entrepreneurs like themselves! Give ’em a vote ’cause let me tell you these girls and their pasta is SO worth it. (Or you can vote here on the DailyCandy Facebook page). To get a lit of taste of the pasta yourself, check out their website or comes to the Boston Local Food Festival on October 2. They’ll be there and so will I! Nella Pasta, you’ve gotten six stars in my book! Have a great, healthy, fresh, feisty day! P.S. My 10 K is TOMORROW! Wish me luck!